BLUEPRINT has MOVED!!! This site will no longer be updated, and soon will be no longer. BLUEPRINT can now be found NEW and IMPROVED at BLUEPRINTCHICAGO.ORG! Come take a look! blueprintchicago.wordpress.com will no longer be updated, and soon will disappear. BLUEPRINT can now be found NEW and IMPROVED at BLUEPRINTCHICAGO.ORG! Come take a look! And as a little enticement of what the new site offers here’s a a hint of the latest post on the new BLUEPRINT . . . GUEST BLOGGER: NOAH VAUGHN . . . .
Noah Vaughn is Chicago’s modern day Richard Nickel. 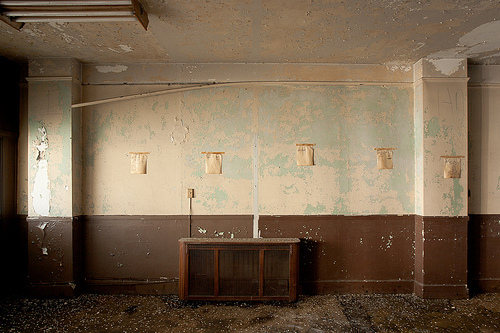 An intrepid urban explorer, he documents vacant decaying buildings through stunning photographs. The following photographic essay will (hopefully) be the first in a series of entries written by guest bloggers who offer different perspectives on the field of architecture. 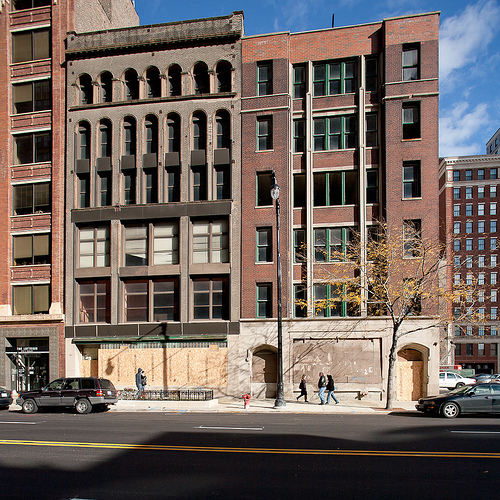 While Chicago’s building preservation community was wringing its hands over the impending demolition of the historic (but vacant and dilapidated) Johnson Publishing-owned YWCA building at 830 South Michigan Avenue, two other nearby buildings owned by Johnson were being torn down without much notice. Too bad, because while they didn’t have the historic pedigree of the YWCA building, they were noteworthy enough to merit a second look. . . . . READ MORE at BLUEPRINTCHICAGO.ORG! The son of a stonemason, it makes sense that Mies van der Rohe was once heard exclaiming, “Now a brick, that is something!” But Mies became famous not for his admiration of bricks, but his mastery over steel. Federal Center is composed of three buildings – the 30-story Dirksen tower (combined office and courtroom building), 43-story Kluczynski tower (office building), and single-story post office – built over a sixteen-year period between 1959 and 1975. The buildings were built to replace the old domed 1905 Henry Ives Cobb federal building – dated in style even before its completion. 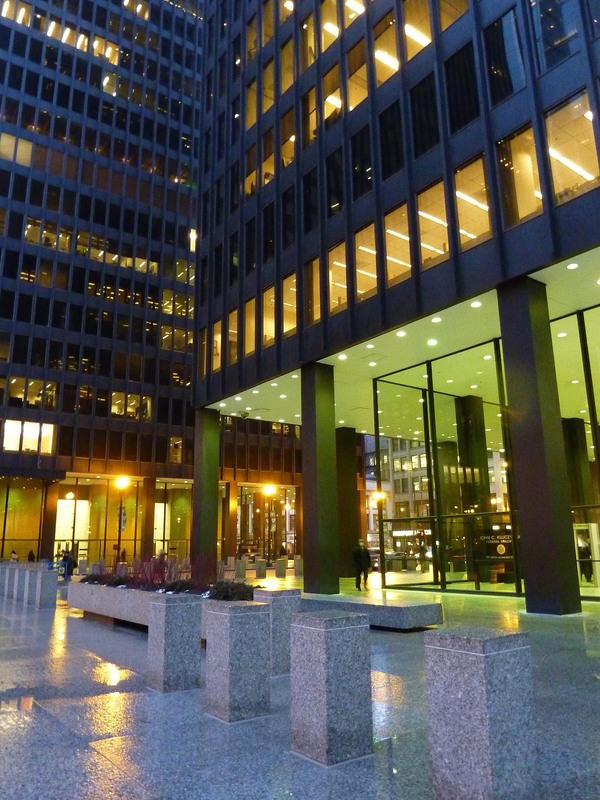 While the classically designed Cobb building was almost imperial in its grandeur, Mies’s design is democratic. His buildings are perfectly transparent – fitting for a government that strives to convey a sense of openness. Also important for government buildings is to embody a sense of order – of which there is no shortage of in Mies’s design. The details combine to form a perfectly unified whole. Mies’s buildings soar up into the sky sleek and modern. They’re both heavy in how they’re made of velvety black painted steel, and weightless for how they float above the ground over big open glass spaces. Their minimal facades reflect the historic buildings surrounding them. 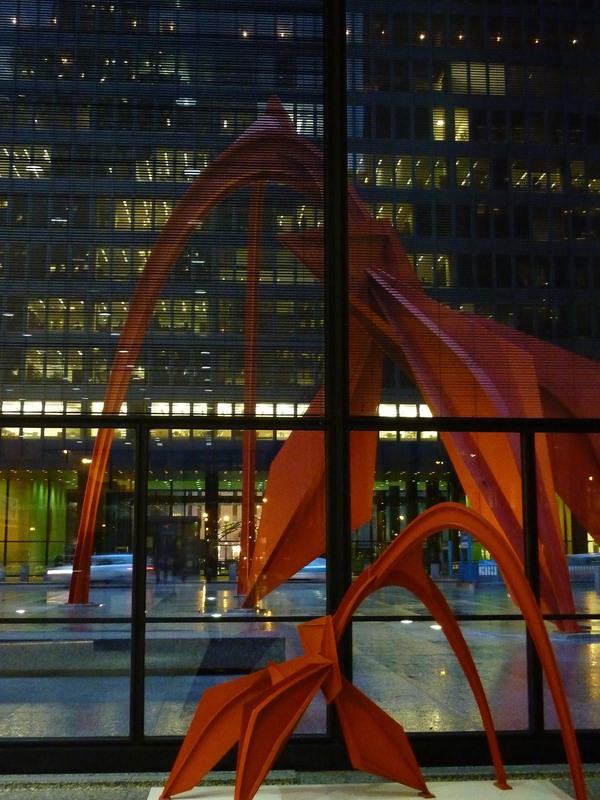 Standing in the middle of it all is Alexander Calder’s flaming red Flamingo sculpture. It simultaneously ties everything together and sends it all into motion. 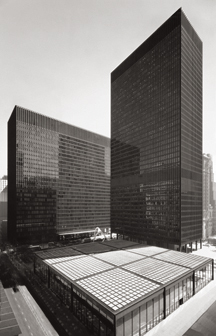 Federal Center was not the work of Mies alone. Though the initial designs were his own, he died in 1969 – six years before the completion of the center. Gene Summers and Bruno Conterato from Mies’s office with the help of associate architecture firms Schmidt, Gardin & Erikson, CF Murphy & Associates, and Epstien & Sons, together carried out Mies’s plan to completion. And you might have noticed that there’s a lot of construction going on right now on the plaza of the Federal Center. To learn more about this stimulus project read this article. FESTOON: a decorative representation of a garland of flowers, foliage or ribbon hung in a curve between two points. 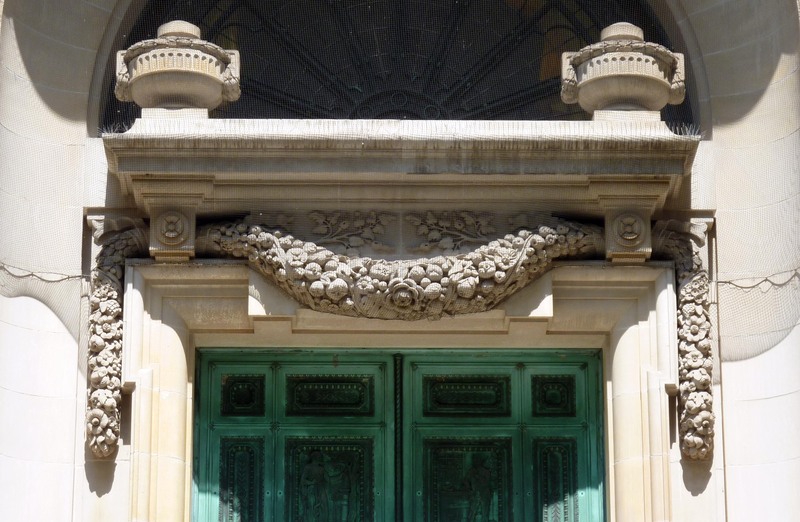 Pictured above is one of Chicago’s most dramatic festoons — on the entrance of the American College of Surgeons. The story behind the Presidential Towers is not strictly about architecture. 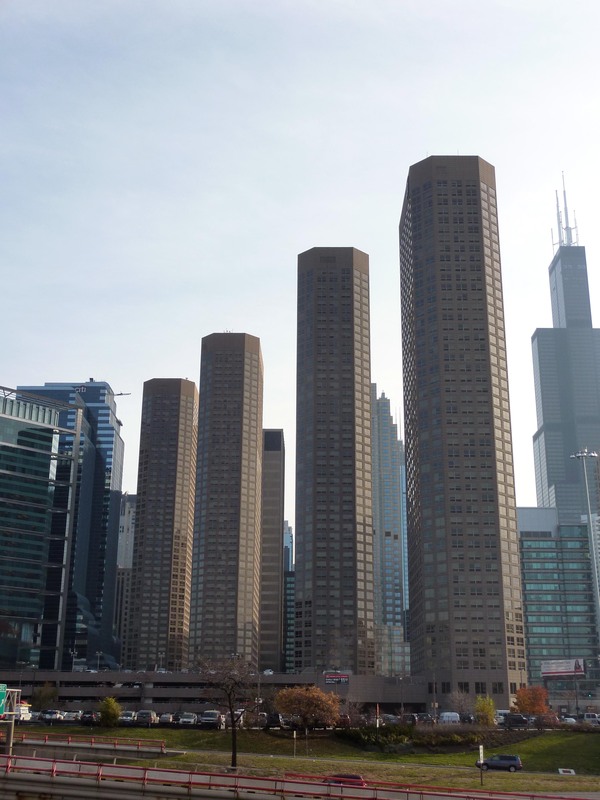 Instead, the four buildings tell a typical tale of Chicago politics — and all the greed, power and corruption you might expect from this city. In the 1960’s the city demolished six blocks of low-income housing and single room occupancy hotels along Madison Street. 7,000 people were left without a home, to make room for five 90-story office towers that were never built. The land stood empty for years. Twenty years later, in 1986, came four 49-story luxury apartment buildings – one just like the other – called the Presidential Towers. The buildings, just over the highway and next door to the Presidential Towers, offered a different reality. Housing projects, liquor stores, crime and people struggling to make ends meet was what defined the neighboring area. It’s no coincidence that the towers were built like a fortress. There’s a single entrance and security checkpoint for all four towers, and as you might expect it’s located in the tower closest to the safety of downtown. From there apartment dwellers take an escalator up to an elevated indoor pedestrian walkway connecting the buildings. Each tower is furthermore locked off from the other towers. What’s facing what was once the remainder of Skid Row? A barrier in the form of a large 3-story parking complex. The developers of the towers did everything they could to barricade the buildings from the surrounding neighborhood. The buildings allowed apartment dwellers to further isolate themselves from the area by providing every imaginable amenity within the confines of the towers. The concept the architects of the Presidential Towers, Solomon, Cordwell, Buenz & Associates (SCB), had was to create an internal neighborhood within the complex. A supermarket, dry cleaners, floral shop, video rental store, and various restaurants were all contained within the buildings . . . not to mention an indoor swimming pool, exercise room, basketball court and running track. With so many conveniences within arms reach, there was little reason for those who lived in the Presidential Towers to ever leave the Presidential Towers. The buildings were in great part made possible through hefty city and federal government subsidies. But thanks to Rep. Dan Rostenkowski (among others), the rules were bent so that the developers did not have to abide by the customary provision to set aside 20% of the apartments for low-income renters. Despite these favors, it wasn’t long before the development met with financial difficulties. In 1992 a $160 million bailout and refinancing of the Presidential Towers stipulated that 5% of the apartments would be allocated to lower income families. Today there are only a small handful of apartments reserved for low-income families. And it’s not surprising that now there are few signs of the urban blight that once marked the area. Instead, the West Loop is quickly growing to be one of Chicago’s hippest destinations. Though the injustices represented by the Presidential Towers were once the source of public outrage, today their story is mostly forgotten. The protests ceased long ago and all that remains are the towers themselves. Though the general sentiment towards their design is as architecture critic Paul Gapp wrote, “banal by the most charitable description,” they’re still elegant in their own way. One after the other, they’re rhythmic. And when the sun is setting, sometimes they even seem to glow. Many of the public amenities like the supermarket and flower shop left the Presidential Towers some time ago. But it looks as though construction has begun to bring many restaurants and other conveniences back to the Presidential Towers. To learn more about the towers remodeling or to learn more about life at the Presidential Towers visit their website. The fight for equal housing opportunities is always present. One such struggle is found at the Lathrop Homes housing project. Recently announced were the plans to change the buildings from low-income into mixed-income housing. 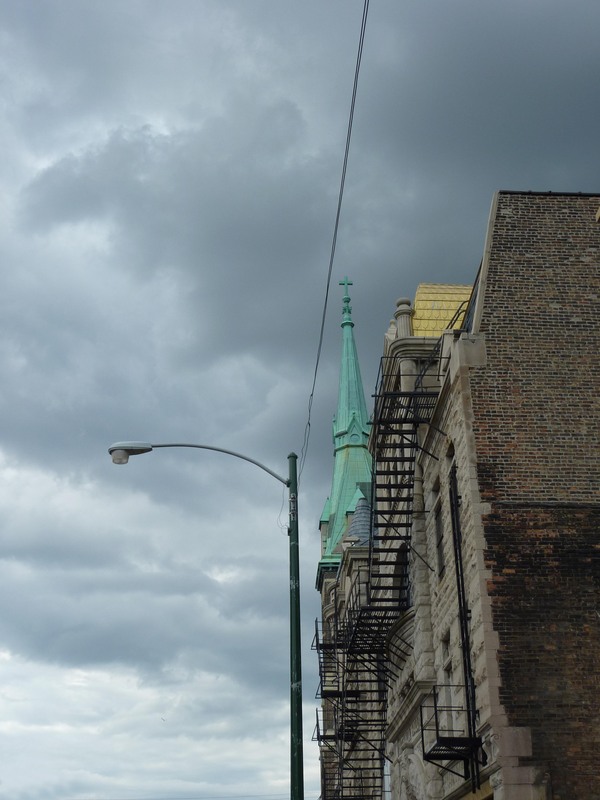 To learn more about the Lathrop Homes redevelopment plans read this. Located at the junction the Chicago River’s three branches, 333 W. Wacker is much more than just another skyscraper dotting Chicago’s skyline. It’s a tribute to the river below, sky above and buildings all around. Sheathed in blue-green glass stretched taught across its curved façade, it appears to be an extension of the glistening green river below. It’s almost as if the river has risen into a wall over the city — like a frozen tsunami. 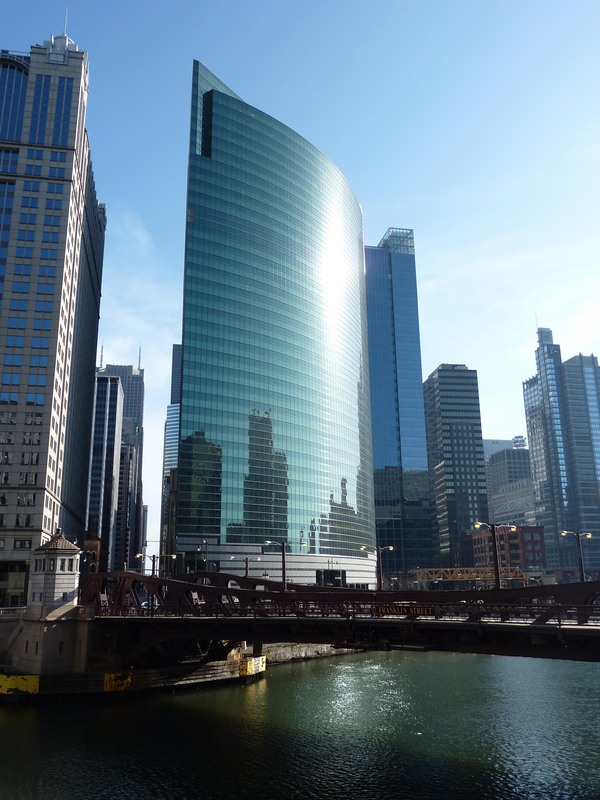 Whereas the river stretches out wide, open and curved, the loop is quartered off and angular – the same is true of 333 W. Wacker. While the side of the building facing the river references the river in curve and color, the sides facing the city reference the city. 333 W. Wacker is shaped like a truncated triangle (or better yet, a piece of pie with a bite taken out of it). 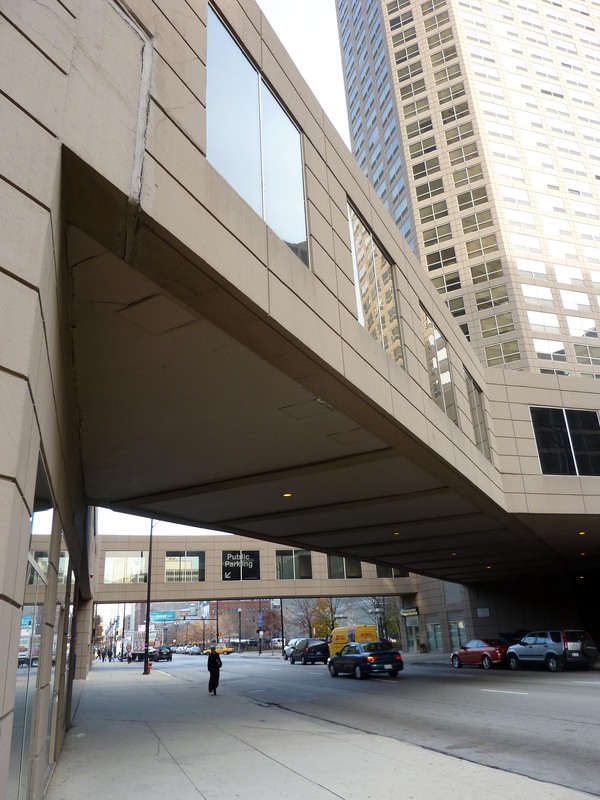 The loop facing sides of the building follow the hard lines of the surrounding structures and elevated tracks. 333 W. Wacker is textbook contextual architecture. 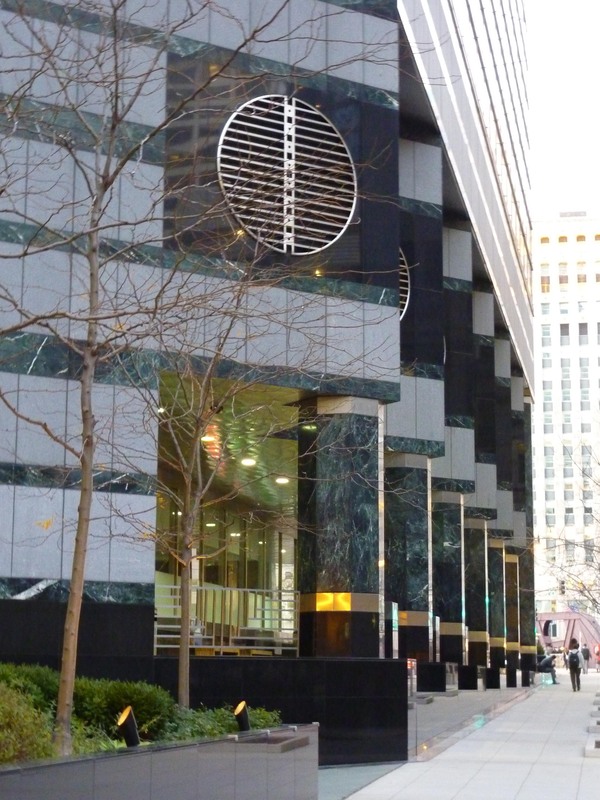 Contextualism is a key principle of postmodern architecture – a label that easily fits 333 W. Wacker. Completed in 1983, it was designed at the height of the postmodern period. Postmodernism was a reaction to the minimalism and severity of modernism. Suddenly architects were keenly aware of the relationships between their buildings and surrounding environments. 333 W. Wacker is the greatest example of this philosophy in Chicago. Notice how it even converses with the Merchandise Mart across the river. While the Mart is rectilinear, opaque and emphasizes its verticality, 333 W. Wacker is curvilinear, reflective and emphasizes its horizontality. 333 W. Wacker was designed by the New York based firm of Kohn Pedersen Fox. When built, it was rare to invite an outside architecture firm to design in Chicago – especially for such a prime location. They were also a small lesser-known firm, without a national reputation. However, the success of 333 W. Wacker put Kohn Pedersen Fox (KPF) on the map as reputable architects in Chicago and beyond. Today the firm is considered to be one of the greatest architecture teams for large-scale international building projects in the world. KPF gained a reputation for smart design through 333 W. Wacker for more reasons than its aesthetic sensibilities. They were one of the first firms interested in sustainable building practices, seen foremost in their choice of glass cladding. KPF chose to use 6 acres (or 275,000ft) of Ford Motor Company’s special reflective architectural glass (at a cost of $1.2million). 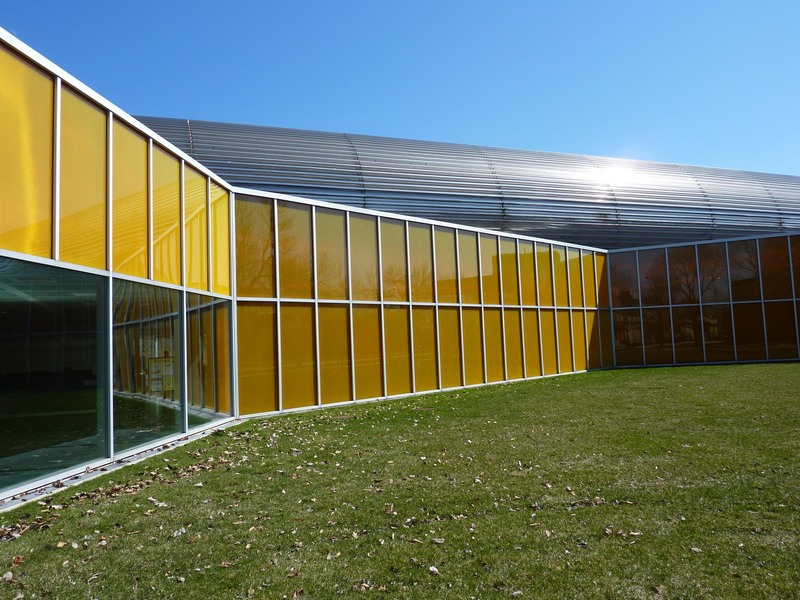 The glass had an inside coating of reflective metallic oxide film which blocks up to 65% of the sun. This allowed for cooling costs to be kept at a minimum during Chicago’s hot summer months. Another smart and not so obvious choice the architects made was to raise all of the offices above the elevated tracks that cut behind the building. Instead of putting offices on level with the roaring trains, large circular air intake and exhaust fans create unlikely decorations seen by curious train passengers. Whether or not it’s perfect, 333 W. Wacker has made it into Chicago’s architecture hall of fame. A timeless classic it will continue to be a favorite of many for years to come. How can we be so sure it’s deserving of such praise? Kohn Pedersen and Fox were since asked to design the two buildings on either side of 333 W. Wacker (225 W. Wacker and 191 N. Wacker), not to mention countless more around the world. It was awarded the AIA National Honor Award in 1984. 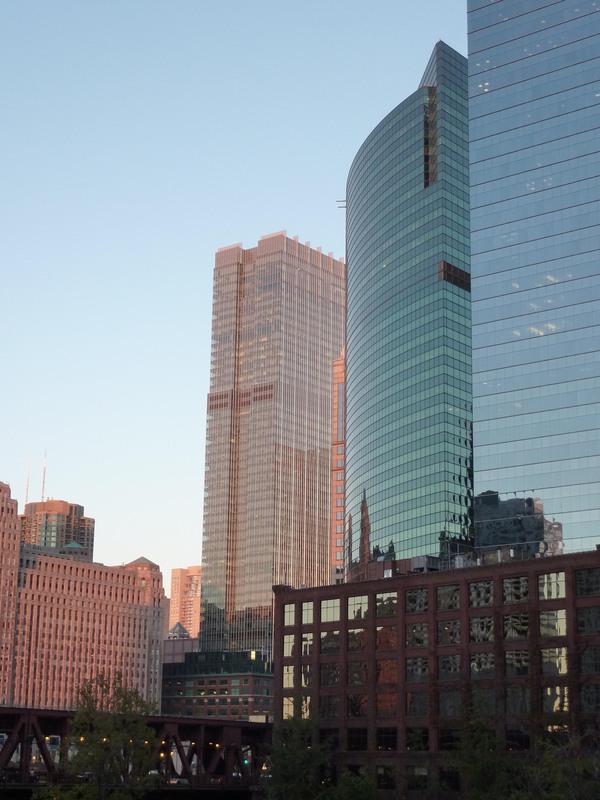 Check out KPF’s website here and their thoughts on 333 W. Wacker here. And Perkins + Will were the associate architects of the building. Here’s their website. MULLION: a vertical member dividing a window or other opening. Notice that the mullions of the McCormick Tribune Campus Center are more than just the glue that holds the windows together. Instead they are also the piers that support the building, and the ornament that helps to visually define the building. One after another they give the building rhythm and make it almost musical. This wordpress site will no longer be updated. For the latest on BLUEPRINT visit BLUEPRINTCHICAGO.ORG!